As of October 2010, this is a map of the current driving test at the 中南信運転免許センター (Chuunanshin Driver's License Center) in Shiojiri for people who are converting their foreign license into a Japanese one. Click on the image for a full-sized view, and read on for tips about the Shiojiri test. Shiojiri's test is, from what I understand, pretty well in line with tests at other centers. 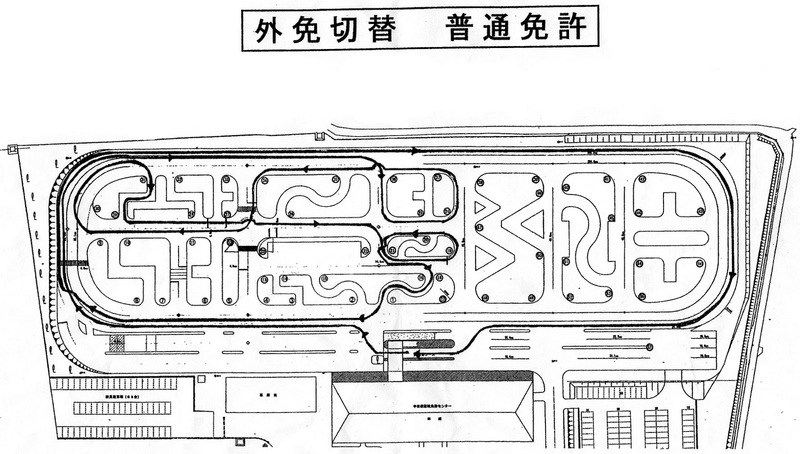 But, you may find maps for your specific driving center in the AJET Driving Book or on a local foreigner mailing list. At the starting line, make sure you are correctly prepared to drive. Signal right, pull away from the curb and up to the diagnol white starting line, then signal left again as you enter the real course. Remember to drive in the correct part of the correct lane. Shiojiri's outer ring has an interesting setup: There are two full-sized lanes for traffic moving clockwise, and only one lane for traffic moving counter-clockwise around the course. In principle, unless passing someone or making a right-hand turn, you want to be in the left-most lane while traveling clockwise. You don't need to signal while turning along the outer ring of the course, and you don't need to stop at the crosswalk on the left side of this image. At number 36 is a tall hedge around which you can't see. Ease yourself gradually through this turn. At number 34 is the stoplight. Stop behind the white line and dart your head around the intersection to show you're aware of what's going on. Coming out at number 30, you'll almost immediately be turning right again at number 31. So, instead of using the left-most lane, use the right-most lane for your traffic direction (in other words, the middle lane of the 3 going around the outer ring). When you leave the crank at number 29, you'll be turning left. This means you have to be especially careful about not hitting your back left tire against the curb as you exit the crank area. At the roundabout driving past numbers 21, 19, and 20, stay as tight as you can to the inside curb. There is a stop sign at number 19, so be sure to come to a full stop (count 1, 2, 3 under your breath) before the white line. When coming out at number 1, turn into the far left-lane. It's legal in Japan and saves you an awkward lane-change step later on. On your final run around the ring, you'll be asked to speed up to 60 kph. When turning back into the parking area, treat the turn like any other intersection: Take it slow and look around. Keep the car close to the curb and pull up within about 10 centimeters of the marker pole on your left side. Nice, thanks for this post! Thank you for this post !! Will be taking the exam again for the second time tomorrow.